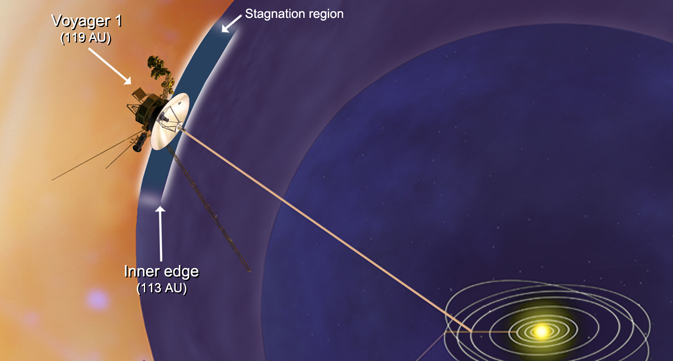 Physics Buzz: Voyager 1 Reaches "Cosmic Purgatory"
Voyager 1 has reached what is now being called the stagnation zone. An instrument aboard the spacecraft has indicated that something is pushing back on this region from outside the solar system. Consequently, scientists hope that Voyager 1 will send back the first data from interstellar space in the coming months. Until about a year ago, instruments on the spacecraft detected charged particles from our solar system at a nearly constant rate. Recently, however, the number of detected particles has dropped significantly. At the same time, Voyager has detected 100 times more particles from outside elsewhere in the galaxy, suggesting that the spacecraft has finally reached the edge of our solar system. Rob Decker, a physicist based at Johns Hopkins University who works on the Low-energy Charged Particle instrument aboard Voyager, said in a statement: "We've found that the wind speeds are low in this region and gust erratically. For the first time, the wind even blows back at us. We are evidently traveling in completely new territory." For more information on Voyager's journey out of our solar system, take a look at this press release from NASA.